For the first time, leading international researchers have made an overview of snow and ice melting globally. The conclusions show that the snow-and ice-covered areas will disappear faster than previously thought. - This is frightening news. World leaders must now work out a solution that ensures dramatic cuts in greenhouse gas emissions. It's not a lokal issue - its a global issue. Today two alarming reports about climate change in the cryosphere has been presented at COP 15. 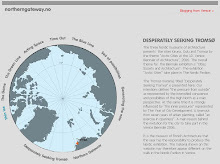 Al Goore and Jonas Gahr Støre presented the report Melting snow and ice-A call for action (made in Tromsø) and Dorte Dahl Jensen presented the report The Greenland Ice Sheet in a Changing Climate. At the pressconference with Denmarks’s Minister of Foreign Affairs Per Stig Møller and Greenland Premier Kuupik Kleist, Norway’s Minister of Foreign Affairs Jonas Gahr Støre, and researcher Dorte Dahl Jensen , it came up a really interesting discussion about Greenlands special position, located by the melting ice in a historical moment where they need to build up their own economy in order to get political freedom. Not to inform ourselves about the progress and setbacs in Copenhagen is no alternative. You can follow the climate negotiations at cop webcast, and read continiously uppdates at cop15.dk/news. At klimaforum09, the alternative climate congress, the voices that are not heard in the official congress gather, share ideas, and creates strategies for a sustainable future. Here comes the environmental movement in the North, together with indigenous people from the South, so this can be a turning point. "We know too little, and it does not exist. We know too much, and it does not exist. To write is to draw what exists out of the shadows of what we know." The following text is written with the possible vulnerability of the event taking place in Copenhagen in December, the United Nations Climate Conference in mind – be aware. 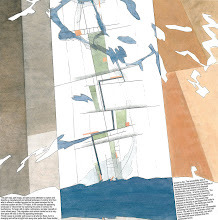 Architecture and planning interacts with a wide range of disciplines. 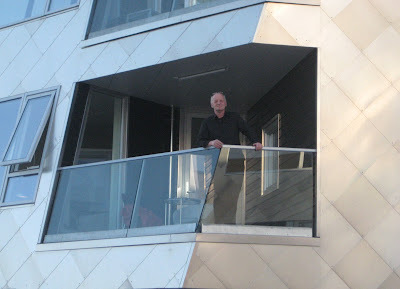 As an architect you need to get an overlook, an understanding of the dynamics in fields far outside our own discipline. How to get there? We already, by keeping updated on the news, know too much about climate change, injustice, financial crisis, poverty and wars to be touched by it. Only rarely something floats up, an image, a story, and moves us. We know too much and it does not exist. But in the undercurrent of this flow of information it is possible to find people, experts on their field, researchers, humanitarian workers and artists that lend their eyes and voice to for us invisible people. Discoveries on the web, dialogue, observations and findings can bring the dynamics of wast theoretical fields and actions within range, opening up for a possible cartography of vulnerability – a discovery. Tandi just sent this beautiful picture from Naroko, she is studying at Sendai this year. And she sends the most beautiful update letters to friends and family. We miss her a lot and wish her all the best! "Japan is a riddle; although we now have a foot inside the door I am not certain it will be enough time to resolve the mysteries that sometimes constitutes our new everyday life....... I can say for certain that autumn here is the most beautiful I’ve seen. The ephemeral character of this season reminds me that this stay is a once in a lifetime opportunity." Vindstille eller storm i København? Over lengre tid er det skapt et forventningsrom til COP 15 gjennom store internasjonale forskningsinnsatser, konstant mediedekning og et vibrerende internett. – Akkurat nå er vi i de reduserte forventningers tid når det gjelder Københavnkonferansen. – En uro kommer nå til uttrykk gjennom opprop i media fra kjente personer og organisasjoner om alt vi kan og bør gjøre selv som svar på den politiske maktesløsheten globalt, sier Knut Eirik i intervju med Jan Carlsen som kan leses i arkitektnytt. For å sitere Naomi Klein (i Dagbladet 18. november): «Hvis klimaet var en bank ville det bli reddet – ikke overlatt til markedets brutalitet». Det betyr ifølge henne at en global ulydighet, en ny type motstand må vokse ut av en mulig København-tristesse. mosaïc::reading - the city as biotope is a master studio at Bergen Arkitektskole run during the autumn term 2009 by Gisle Løkken, Magdalena Haggärde, Kjerstin Uhre and Knut Eirik Dahl. Under the themes of new hierarchies, imbedded information, elasticity, dynamic of small cultures, points of departure, vulnerability and charging the landscape with new energy different aspects, ideas and possibilities of planning have been discussed and discovered - at the school in Bergen, on study trips to Malmö and Paris and on the blog cityasbiotope. 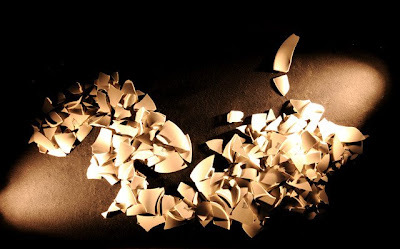 The blog have grown throghout the semester with the students’ work, the presentation of new themes and comments Here, in this little textbook: mosaic::reading, the collection, we have gathered the introduction texts for each theme. 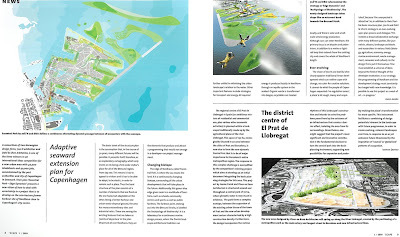 Our proposal for Nordhavnen is being discussed in the latest issue of Conditions magazine. Under the interesting label Dead or Alive the uncertain futures of winning competition proposals are being researched. 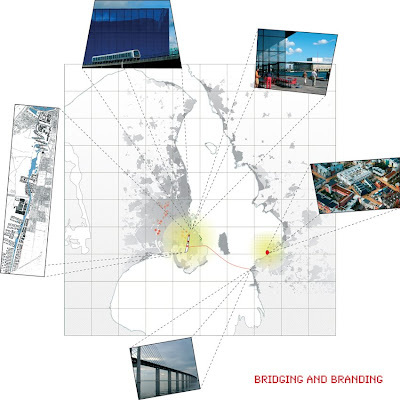 During 2008 the Tromsø based firms 70°N arkitektur and Dahl&Uhre architects were awarded 1.prizes in two important competitions in the Øresund region. 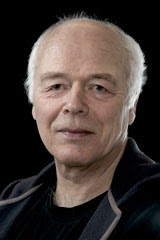 In 2007 the cultural fund Realdania launched the two parted idea competion Öresund Visions 2040. 70°N and D&U’s concept Mosaïc::Region recieved one of two first prizes. The discoveries in this larger geographical and time scale made it mandatory for the team to take part in the Nordhavnen competition. Also in this ambitious idea and planning competition, 70°N and D&U received one of three first prizes with the concept Excentral Park – Edge Dynamics. The competition was organized by Copenhagen City and its institution City and Harbour (By og Havn). The timeline for realizing Nordhavnen is unto 2060. The jury in Öresund Visions 2040 consisted of leading academics, artists and young architects. The jury in the Nordhavnen competion was more of a political stronghold including lord mayor of Copenhagen Ritt Bjerregaard and mayor Klaus Bondam among others. 40 000 workplaces on an industrial landfill out into the seascape of Öresund. The competition program was ambitiuos on all levels of sustainability, bordering on images of the ideal city, as the political and planning forces of Copenhagen see it to day, prolonged into an unknown future. The fact that Copenhagen hosts the United Nations Climate Conference in December 2009 (COP15) informed the program with the ambition that Nordhavnen can be presented here as a world leading Copenhagen example. The jury said this about Excentral Park – Edge Dynamics: “The jury believes that the entry presents, through its strategies, a genuinely new perception of a structure plan and consequently sets new horizons for urban development”. With this enlightening jury comment the Norwegian firms entered a second phase with the two Danish winners as opponents. During three months, in continuos dialogues with a board of representatives from the Copenhagen authorities, City and Harbour and three former jury members, the concept was tested related to a series of questions from this board, and the jury. After these explorations of the concept the Norwegian firms recieved a short note from the board that one of the Danish groups was chosen as advicers for the planning process in Nordhavnen. Up to now the Norwegian team has not seen any extensive response of any kind on this second step. The team has lately been debating their concept in the context of both the Danish and Swedish associations of Landscape Architects. Before a very vibrant discussion on their Edge Dynamics concept took place at the conference World in Denmark this summer, the Norwegian team asked Kent Martinussen, leader of DAC and part of both the jury and the board in Nordhavnen, why this enormous extension of Copenhagen is nearly not visible in the media. He said that there are three reasons. 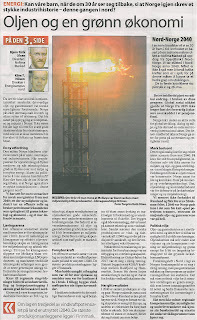 The first is that COP15 is dominating all media, nothing else makes the headlines. The second is that nothing is discussed before the building cranes are in Nordhavnen, the third is that strong political forces goes for a freezing of the whole Nordhavnen concept, in a time of financial crisis. An experience with both competitions in the region is that there to a very little extent is an offensive attitude from the inviting parties towards the media. No press conferences and debates of any importance, no debating arrangements around the exhibitions and so on. 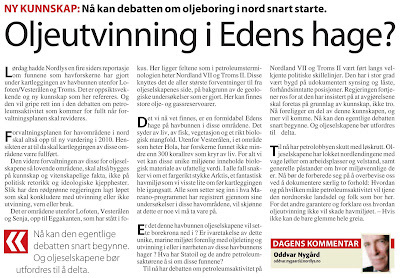 If and when the team and the Edge Dynamics concept will reappear in the Nordhavnen context is yet unknown. Conditions will present the Norwegian team’s Öresund findings in an upcoming issue. For the moment The Nordhavnen concept is exhibited in Hamburg, and the team, 70°N and D&U, is now following up their Öresund encircling in a master studio at BAS, possibly waiting for the next challenge in the Öresund Metropole. 160 projects in three Norwegian cities is to be evaluated by a very interesting Norwegian Europan 10 jury, the 1.and 2. of October. In the afternoon Friday the 2. the jury member Ellen van Loon, partner in OMA, will give a lecture at the 0047 gallery in Oslo, followed by a conversation with the president of Europan Norway, Knut Eirik Dahl. Last week we were revisiting the Øresund region with our mosaïc mindset and 19 architect- and landscape architect students from Bergen School of Architecture. After studying Malmö in the virtual world for two weeks, under the headlines of New Hierarchies and Imbedded Information, it was time for us and the students to enter this field of exploration, walk the streets, meet the people and hit the dynamics and the patterns that connects.... An in depth research into the imbedded information of Malmö. On Thursday we had conversations with prof.Carola Wingren and her students from the landscape architect department at the Swedish University of Agricultural Sciences in Alnarp. The journalist Peter Sylwan and the head of urban straties in Malmö, Johan Emanuelson, guided us through the possible future agricultural landscape and into the growing city. Carola Wingren's master course is dealing with how Malmö can meet future challenges from sea level rise. SLU Alnarp is set in a large, old park with thousands of species plants and trees north of Malmö. We rounded up this fine day with a walk in this beautiful park. The Malmö findings will be posted at city as biotope under the label Elasticity. 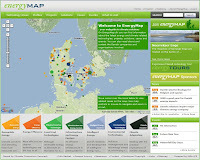 EnergyMap is the national Danish internet portal for energy and climate related solutions. On Energymap Danish companies, organisations, institutions and public authorities are given the opportunity to present their work and ideas on technologies and programmes that may help combat climate change and improve energy-efficiency. Users of EnergyMap are invited to explore the solutions, cases, projects and events presented on the portal. Many of the featured sites are open for visitors and many also offer investment opportunities. The United Nations Framework Convention on Climate Change secretariat has cooperated with Google and the Danish government as hosts of COP 15 to display official UNFCCC greenhouse gas (GHG) emissions data for Annex I Parties using Google Maps. The Maps are now online and can be accessed on the UNFCCC GHG data interface. 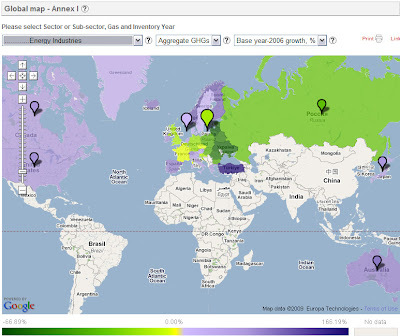 Users can select on a world map total national GHG emissions/removals as well as emissions/removals from various sectors; absolute numbers (in Gg CO2 equivalent); or relative changes in emissions (in per cent compared to the base year level). Information is provided for all sectors (such as energy, agriculture, etc) and for the major sub-sectors (such as transport within the energy sector). By gas, the data cover aggregate GHGs, CO2, CH4, N2O, SF6, HFCs and PFCs. The exhibition Seismograph City is open from June to September this summer in Hamburg. Our project, Nordhavnen / Excentral Park - Edge Dynamics is exhibited together with other projects under the title Sustainable Strategies in Dialogue. The universal city defines itself not only as the catalyst of cultural, social, economic and ecological processes, but also as the seismograph of global developments. Never before has there been such consensus between politicians and the public on the question of how we can innovatively and constructively improve our living environment. Given global challenges to develop sustainable strategies in architecture and urban design, the architectural profession assumes a significant role and responsibility. 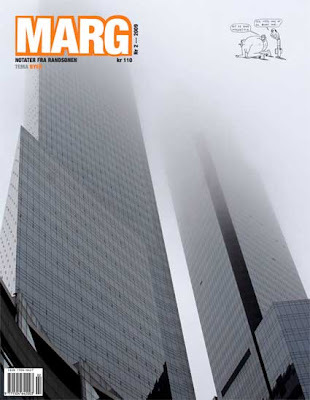 This exhibition and catalogue present a diverse spectrum of buildings in various stages of development and completion as well as visionary designs which address sustainable strategies in the context of current architectural and urban developments worldwide. Selected projects provide an exciting insight (not overview) into current planning in the city of Hamburg, as well as a fascinating and rather surprising collection of projects, designs and visions which excite our imaginations, give us strength, motivation and which hopefully inspire us to further examine themes of sustainability. Three of our projects are mentioned in the latest issue of PLAN - Tidsskrift for samfunnsplanlegging, bolig og byplan og regional utvikling. 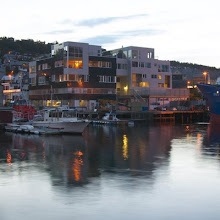 John Pløger refers in his Article, Ambivalens og etos - forskjeller og likheter i byplanlegging i Norge og Danmark, to The Game of Tromsø and The Year of Urban Development (BYÅR05) as some of the more "spectacular" experiments in norwegian planning, with reference to our paper Openness and experiment. 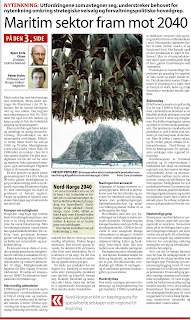 Hanne Bertnes and Aasne Haug uses the Nordhavnen competition as a case in the article Et møte med dansk planmiljø. "Hvordan sikres intensjonene i en god plan? Er det i styrkeforholdet mellom offentlig ansvarlighet og private investorer man finner svaret, eller er det mer i prosessen og mindre i selve svaret? De tre vinnerne etter første runde i Nordhavnen hadde ulike svar på akkurat dette. Mens de to danske prosjektene la opp til en "tradisjonell" planstrategi der planen definerer de fysiske strukturer, satset det norske vinnerbidraget på en prosessbasert planstrategi, der viktige offentlige strukturer defineres, men der fremtidens fysiske omgivelser defineres suksessivt med utviklingen. Denne tankemåten erkjenner at vi ikke vet hva fremtidens samfunn trenger, men er samtidig mer krevende for planleggere og utviklere som ønsker forutsigbarhet." "How to secure the intentions of a good plan? The three winning concepts in the Nordhavnen competition had different answers to this question. 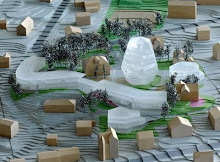 While both the danish projects presented a 'traditional' planning strategy where the plan defines the physical structures, the norwegian winning proposal went for a process based planning strategy, where important public structures are defined, but where the physical surroundings of the future are defined successively with the development. This thinking recognizes that we do not know what tomorrow's society needs, but is at the same time more challenging for planners and developers who wish predictability." Jan Carlsen har intervjuet Knut Eirik, Marius Nygaard og Harald N. Røstvik om Cop 15. med utgangspunkt i Excentral Park - Edge Dynamics. Arkitekt Marius Nygaard, førsteamanuensis ved Arkitektur- og designhøgskolen i Oslo, har deltatt i professor Bente Klevens lærerteam for studentene på andre årstrinn. – Kurset brukte konkurranseutkastet til 70°N arkitektur og Dahl & Uhre for Nordhavnen i København som byøkologisk rammeverk for oppgaven, forteller Nygaard. – Studentene tegnet et besøkssenter med biologisk mangfold og økologi som tema. Slik ble studentenes arbeid indirekte knyttet til oppkjøring mot COP 15-konferansen. ...vår profesjon har makt til å forandre mye. Derfor må arkitekt- og byplanutdannelsen styrkes med hensyn til bærekraft. Politikerne klarer ikke jobben alene – det demonstrerer de hver dag. Naturen kommer til å skake oss voldsomt hvis vi ikke ser alvoret i klima- og energisituasjonen, avslutter arkitekt Harald N. Røstvik. ....Næringsstofferne forvilder sig ud i naturen fra landbrug og afbrænding af fossile brændstoffer. Kvælstof kommer via luften, og kvælstof og fosfor transporteres også ud i naturen med drænvandet fra de dyrkede marker. Det er velkendt, at næringsstofferne slukker lyset og skaber iltsvind i søer, fjorde og lavvandede havområder, men næringsstofferne ødelægger også levestederne på land. • Udvide arealet med urørt skov i Danmark ved at standse den forstlige drift i eksisterende skove. • Sikre græsning af eksisterende naturområder i Danmark, som i dag henligger uden græsning, både skove og lysåbne naturtyper. • Beskytte eksisterende naturområder mod næringsforurening ved at udlægge dyrknings- og gødningsfrie bufferzoner i kanten af marker, hvorfra der i dag foregår udvaskning til overdrev, heder, moser, skove og enge. Ikke bare helt nede ved selve vandløbet, men oppe i kanten af marken, hvor ådalen, kystskrænten eller strandengen begynder. • Genskabe det naturlige vandkredsløb i eksisterende naturområder ved at sløjfe dræn og grøfter og beskytte eksisterende natur mod vandindvinding...."
Knut Eirik kommenterte teksten slik: Interessant tekst! Kjenner dere kunstneren Christos prosjekt der han la rød duk rundt hver av øyene i et arkippelago utenfor Florida: Kan jeg oppfatte deres strategi dithen at dere lanserer en beskyttelsesone rundt den eksiserende natur dere vil forsterke? Nærmest som et naturarkipelago i et jordbrukshav, og at dette er en slags hovedstrategi? Les hele kronikken her: Politiken.dk! 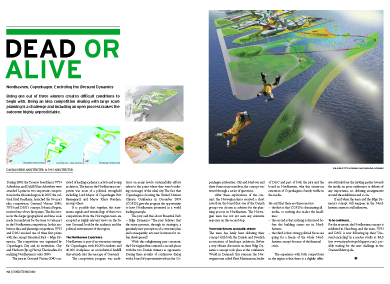 The duch architect and writer Joren Jacobs has made an article about the planning strategies in our Nordhavnen project, Edge Dynamics in 'scape 1# 2009 . In the era ‘after COP 15’ it is possible to picture a new type of discourse about cities’ and landscapes’ development that might proceed in other directions than the presumed ideal, linear urban development of an ideal site. Such an enlarged perspective, this essential side view, is difficult to trace in the competition program for Nordhavnen. In the previous diagrams, illustrating the regional dialogue between Denmark and Sweden up until COP 15, one clearly sees a hyper attention in both politics and development about current projects. In the third diagram it is claimed that the different projects cannot be seen on the site alone, nor in their close city surroundings, but that every single project developed in the region must relate to a larger geographical picture and a larger time frame. It is a fact that the region can absorb a large growth; compared to Holland the entire Ring City (‘the green heart’) with approximately 7 million people can be ‘relocated’ to the Øresund region (‘the blue heart’). The region of Øresund can be seen as a complex dynamic of events. Additionally in Nordhavnen after COP 15, a renewed ecological reflection must characterize both the natural-, the production- and the urban landscape. The ambitions are several, but the future insecurities on every level are larger. In Nordhavnen this means, ‘not to be able to predict time, but to use time as a material’. 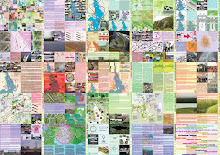 In such a dialogue between ambition and insecurity the fundamental structure of Nordhavnen might contribute to adjust urban conditions on several levels: - locally in Nordhavnen, in a larger picture containing all the large landfillings in Copenhagen, in a larger timeframe and geography embracing events in the entire region, in the Øresund metropolis’s future containing limitless exchanges and high velocity networks, and not the least in a global discussion about urban sustainable development. This Map (and text) is from the 1st price project in Nordhavnen,(1st face), Copenhagen: Excentral Park - Edge Dynamics, which we did together with 70°N and a panel of experts. Uncertainty in the larger geography and time. In the contest program the development of Nordhavnen is motivated by Copenhagen’s future increase in population, and by the fact that other areas are filled up faster than one thought prior. 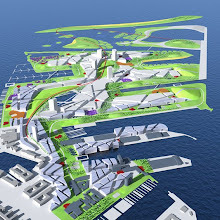 The program’s dialogue is limited to other closely located development zones as Ørestaden, the Carlsberg area and Kløvermarken. Nordhavnen must be explored and developed in a larger picture, where both the global as well as the regional context are at work. 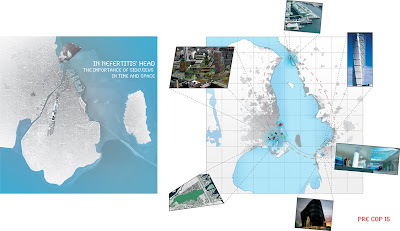 The idea of the Øresund region opens for an image where Nordhavnen enters into a dialogue with events and developments in a geographically larger region; in Malmö with Bo01, the new metro and the urban development project in Hyllie, and in Helsingborg with the development of Norra hamnen and H+. There is a kind of conversation, if not an exchange, between these initiatives as markers in the possible future metropolis image of Øresund. There is every possible reason for developers and developing constellations to look aside. This Map (and text) is from the 1st price project in Nordhavnen, (1st face), Copenhagen: Excentral Park - Edge Dynamics, which we did together with 70°N and a panel of experts. "Den måten Norge håndterte oljerikdommen på er unik i internasjonal industrihistorie. Når tyngdepunktet for oljeutvinningen nå flyttes nordover og når teknologifokus gradvis flyttes over mot miljø og fornybar energi; klarer da politikerne å vise samme handlekraft? Kan våre barn, når de om 30 år ser seg tilbake, si at Norge igjen skrev et stykke industrihistorie - denne gangen i nord?" The competition of Ørestaden in 1994 can be seen as Copenhagen’s urban answer to the Öresund Bridge project. The program for Ørestaden was as ambitious as for Nordhavnen, but in a different time. Here the ambitions of Copenhagen as an important city in a European economic picture were dominant (new Docklands etc.) The ideal world of Ørestaden, as a line of growth out towards Amager’s periphery, have not however been sustained in dialogue with the larger image of the city. More interesting urban developments have taken place in other parts of Copenhagen, and ideas and ambitions have disintegrated in Ørestaden’s era. Nordhavnen has now been designated as the place for seven present ambition’s criteria summed up as ‘The Sustainable City of the Future’. As in Ørestaden a linear direction of development has been chosen, but this time directly into the Øresund Strait, functioning as a game board for these ambitions. The program’s statement is that all ambitions that have not taken place other places will happen here, - not unlike the ‘best of all’-programs for Ørestaden. I to dager har Kjersti Nerseth, NALs president vært i Tromsø. En dag med byens arkitekter og en dag med byens administrasjon og politikere. Temaet er regjeringens kommende arkitekturpolitiske handlingsplan. Spesielt engasjerende var møtet med leder for byutviklingskomiteen Eduardo da Silva(AP), byplanssjef Erik Øwre og arkitekter fra Tromsø, Bodø og Mo i Rana. Nerseth viser til Tromsø som forbilde nasjonalt med de to store byutviklingsprosessene Spillet om Tromsø/1995 og Byutviklingens år/2005. En intens og flott diskusjon oppsto rundt den siste prosessen som jo var igangsatt av politikerne, men som ble ledet og gjennomført med en ledelse på utsiden av systemet. Se visepresident i NAL, Gisle Løkken sin aviskronikk i tidligere post på bloggen. Vi syns byplanssjefen oppsummerte drøftelsene på en fin måte da han sa: ”Kanskje det er på tide å lansere noen helt nye ambisjoner for byen”. Mer om dette senere….! I møte med ordfører Arild Hausberg og kulturråd Irene Valstad Simonsen kom det interessante i at Tromsø kommunes parole om 100% barnehagedekning faktisk har ført til en rekke fine prosjekter som er prisbelønnet og som har fått stor internasjonal oppmerksomhet. Altså et dristige politiske signaler får arkitekter til å ta seg helt ut og bli oppfinnsomme. Avisa Nordlys samlet deltakerne ute i solen og trykket lien spalte dagen etter. Vi synes presidentens Norgesturne er flott, og er glad for den innlevelse hun viser. Spesielt gleder vi oss til redaktøren av Arkitektnytt kommer med et helt nummer om denne dramatiske krysningen gjennom landet. State of the art klimapolitikk, forskning og tiltak i Norge? Mat og Landbruksdepartementet har nylig arrangert en konferanse på Gardermoen hvor forskere og politikere la fram målsetninger og forskningsresultater. Vi hadde lyst til å dra… ikke anledning, men nå kan vi alle gå igjennom powerpointpresentasjonene som er lagt ut på M&Ldep’s debattsider om landbruk og klima. NAL-president Kjersti Nerseth besøker alle lokalforeningene i NAL i løpet av 2009. Hun var her i går og i dag sammen med redaktør i Arkitektnytt, Grete Kristin Hennissen og direktør i NAL, Pål Stephensen for å samtale med politikere og arkitekter. 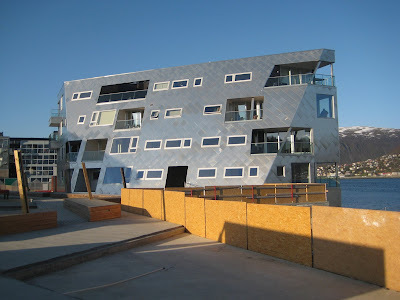 I morgen legger vi ut en liten tekst om Tromsøsamtalene... Regjeringa legger i løpet av sommeren 2009 fram en handlingsplan for arkitektur i Norge. Gisles Kronikk i Nordlys setter den lokale arkitekturpolitikken i perspektiv. ”Det er ikke nok at tro, at vi kan genopprette en balance. Det bliver nødvendig med en løpende og dynamisk tilpasning til de dramatiske klimaændringer. Hvordan udvikler vi vores civilisation under disse skiftende vilkår? - der kan transformere seg sammen med byen – at tilpassningen til klimaændringerne kan foregå dynamisk og hurtig nok”. På UIAs fagseminar 15. og 16. juni annonserte jeg at dette utsagnet fra Peter S. Jørgensen i Weekendavisen skulle være mitt point of departure. Som sagt så gjort. Sammen med en nytenkning rundt byutviklingens år avstedkom dette nogle flotte diskusjoner. Jeg viste kartet fra utstillingen Tromsø X-Files i 2005 der alle de nye prosjekter antastet byen nærmest som røde hunder i boligboomens epoke. Samtidig viste han en slående framstilling av hvordan planetaten nesten aldri var de som initierte og startet prosjekter, og at de altså nærmest kom i offerets posisjon – sterkt! Journalisten fra Fædrelandsvennen som var engasjert tilstede begge dagene grep jo straks tak i at Tromsøs oppdagende og avdekkende metoder burde kunne tilflyte Kristiansand. Altså at det å stille ut er åpne opp. Mens utbyggerne i Kristiansand tilsynelatende har lite sidesyn til en verden i endring, så debatterte foreleserne på seminaret dynamikk, endringshastigheter og nye og overraskende samarbeidsformer i bylandskapet på friskt vis. John Pløger var gledelig tilstede med Lefebvre og innom Marianne Skjulhaugs tekst i Marg, Innviklede forbindelser som søker en form. Gjennom begrepene den kroppslige by, den relationelle by, den narrative by og den meningsfulle by utfoldet han et bilde av hverdagslivet mellom det tenkte, planlagte, og det levde. Han karakteriserte ”handlingen som kontinuerlige brudd med signaler, normer og konvensjoner”. Kveldseansen i Håndverkerens mørke kulisser med tema Toleranse, litteraturen og byen vår en flott opplevelse med tente, vel forberedte innledere. Paal-Helge Haugen fikk sitt Marg og var meget glad for det. 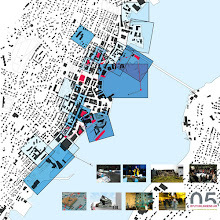 This map was our starting point for an investigation on a city development in Stavanger in 2000. 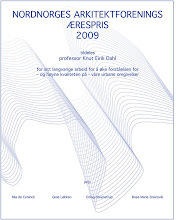 It led, together with Paolo Viganos lecture in Cordoba (Europan, 2003) to the text ”Topografiske attraksjoner” (topographical attractions), published in Arkitektnytt in 2003. In the spring 2010 we will revisit the study field of Jæren through the course, Appearing and Disappearing Landscapes, which is part 2 of AHO's "Research on the Norwegian Landscape". 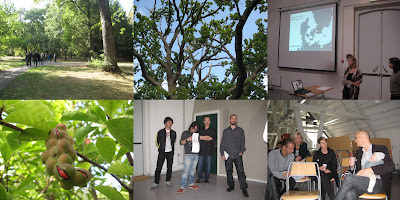 The course is an inter-Nordic cooperation between the AHO and Forests and Landscape at Copenhagen University. Jæren is a region that today has the largest urban growth in Norway after Oslo. The region, which is the centre of oil development in Norway, is now entering into a new phase, causing both landscape and urbanity to be in need of reinterpretation. The course will establish recognition on the larger scale that will affect knowledge built up during the course work. The UN climate conference, COP 15, in December 2009 will send out signals concerning this larger scale. The Course is planned as a discourse between landscapes and urban conditions that range from the smallest biotope to the larger future image. 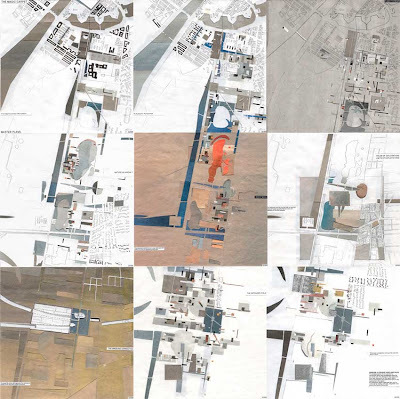 Students will throughout the semester work on individual projects as experiments in the relationship between different territorial contexts and urban strategies; this will entail both a smart and innovative cartography and conceptual design projects. Uroen som ligger som en undertekst i alle artiklene i siste nummer av Marg framkaller denne headingen; byen under press. Peter S. Jørgensen sin tekst New York – retten til byen beskriver hvordan nye bevegelser og understrømmer i megabyen er i kontinuerlig dialog og konflikt med administrative virkeligheter og planleggingsteser. 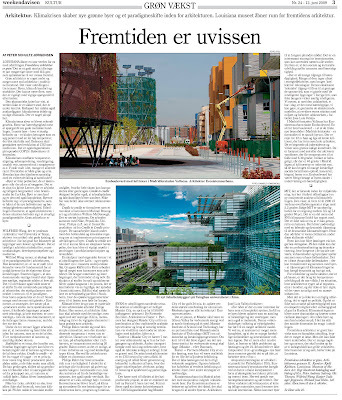 I Weekendavisen nr 24, 12. juni har han besøkt utstillingen Fremtidens arkitektur er grønn. Arkitekturens grenser II på Louisiana. Universitet i Agder er midt inne i sitt forskningsprosjekt City and Tolerance. 15. og 16. juni arrangere UIA et fagseminar med overskriften Byplanens dilemmaer. Knut Eirik foreleser på dette seminaret under seminaroverskriften hva kan byplanleggingen tilby og med forelesningstemaet Byen under press som drar noen linjer videre fra det Peter S. Jørgensen åpner for. Heri inkludert noen nye betraktninger rundt Byutviklingens År 05. Her møter han bla Roy T. Eriksen som foreleser om Vandringer i et ruinlandskap som er en utvikling av hans tekst i siste nummer av tidsskriftet Marg. Til Kristiansand kommer også Jonny Aspen som stiller spørsmålet trenger vi byteorien og John Pløger som utdyper hva som gjør byrom til samhandlingsrom. Toleranse, litteraturen og byen er temaet for en kveldsforestilling i Håndverkeren den 15. der John Pløger, Paal-Helge Haugen, Torild Wardenær og Knut Eirik Dahl skal skape noen åpninger. Each element, every trace describing the appearing manufactured and spiritual landscape is to be considered as resisting change, interposing processes which resists and reformulate actual interventions in space. A canal or a lake can thus fashion a word of ideas for what is to follow. A planted forest will after 20 years demand respect and care. An area in which all of nature is subject to change during 30 years will by virtue of that change draw attention to itself and become an alternative to all development strategies. Our concept entails exploring how such an incipient landscape shapes its capacity for resistance, in other words how it is shaped in time. 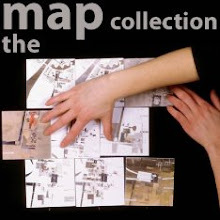 We made this map over Ørestaden in 1994 as a part of The Magic Carpet. It has been raining now for ages it seems. But in early May we had wonderful days when the arctic spring was trying to get a hold on Strandkanten. We have been living here in our own project for a year now- as an experiment- in a random choice of one of the apartments we have designed. It has been a positive experience. We’re also happy about the landscape project, which are under completion these days, made by Aurora Landscape in collaboration with Ljusarlitektur, 70°N and D&U. Landscape architect Anita Veiseth has done a great job in facilitating the project for teenagers. 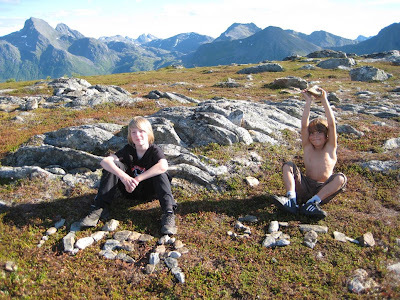 The young boys, 13-19 years old have already made this landscape their spot in Tromsø. 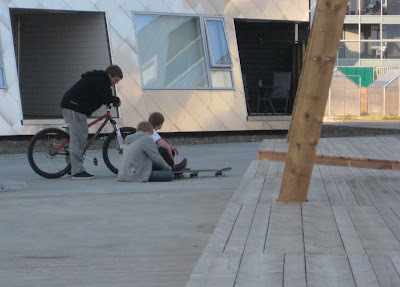 They are hanging out, playing football-games, basket ball and of course skating. 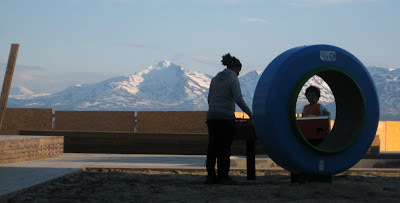 Through the Game of Tromsø, we discovered the urban potential of the area. In 2000, as a part of a political process, we reworked the master plan for Strandkanten in collaboration with 70°N and Code. Knut Eirik Dahl has recieved the Northern Norwegian Architects Association's Honour Award for his enduring efforts to increase the understanding for -and raise the quality of- our urban environments. .
- The rehabilitation of Hamningberg in East Finnmark.The project has been a collaboration between Båtsfjord, Vardø, Finnmark Fylkeskommune, Riksantikvaren and Statens Vegvesen. The prize ceremony for the Northern Norway Architecture Award was in Tromsø at NAF's annual meeting, june 5. 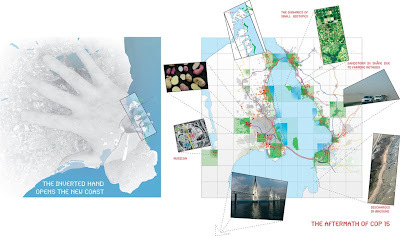 This map from 2006, which we made for the arctic cities exhibition at the 10'th architectural Biennale in Venice together with a great team, shows the early estimates for the meltdown of the ice cap. Today we know for a fact that the process is going much faster. 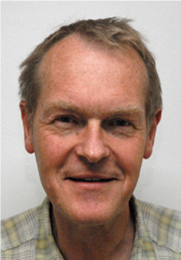 Two years later Jan Gunnar Winther, Director of the Norwegian Polar Institute in Tromsø, stated: ”The summer of 2007 was a record year climate-wise: the ice in the Arctic was down 20% from the previous record year in 2005. 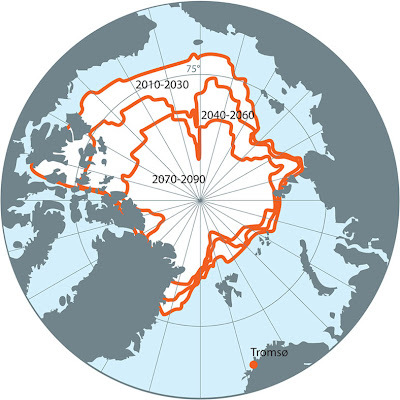 The September Ice in 2007 was historically small in scale and one thus expects a new record low in 2008. Mathematical climatic models has not been able to take into account these fast changes. They don’t reproduce reality well enough.” The climate change sets new conditions for spatial planning. Read more in Appearing and disappearing Landscapes in On Site, the book will be launched at the Architekturforum in Zurich tomorrow. FNs klimapanels siste hovedrapport omtaler Arktis og lavtliggende øyer i Karibien, Stillehavet og andre steder som noen av de mest sårbare områdene for klimaendringer. Alliansen Many Strong Voices skal jobbe for en internasjonal klimaavtale med omfattende globale utslippsreduksjoner. Along the ridge of Tromsø Island there runs a band of continues woodlands – the Tromsø Common – which in size and extension corresponds to that of Central Park in New York. 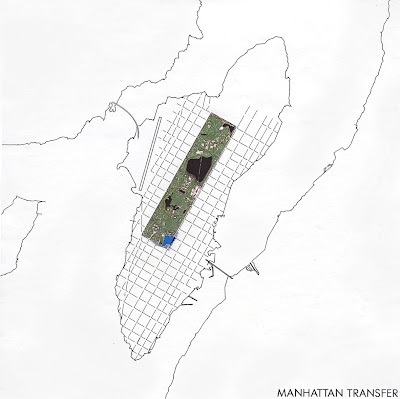 Back in 1994 we superpositioned Manhattan on this map over the Tromsø Island. Tromsø was experiencing an explosive urban growth, and it was necessary discuss the lokal attitude towards nature as an unlimited resource. The Tromsø common vas already changing from being nature to become a park. 14 years later the map still has actuality in the urban discource i Tromsø - it has proved to be a valid statement. The fact that we have an urban park of an international format is the most visible urbane trait in Tromsø that necessitates a further urbanisation. The Green Line bind all the city areas together, in winter functioning almost as a metro for cross-country skiers and families on a hike. Artist/musician Amund Sjølie Sveen speaks to us back from 2036 and tries to analyze the changes that have lead to establishment of the USB and proves that the opening of a new IKEA-store in HaparandaTornio in 2006 is a major event in the history of the Barents Region. What happens when the region experiences a potential change from periphery to center? Why are we all talking English to each other? Welcome to the brave new world of the United States of Barents! 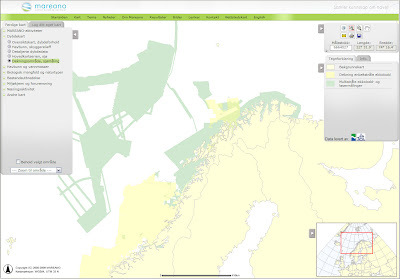 This screenshot of the MAREANO map viewer shows the area of hydrographic survey data at the Norwegian continental shelf, an area bigger than the Norwegian mainland. On the MAREANO map wiever you click into registrations, images and videos of the seabed. Global heating increases the pressure on coastal areas and ocean zones, the seabed itself and the quality of the ocean areas are at stake – the resources here constitute the world’s future "granaries" and "larders". 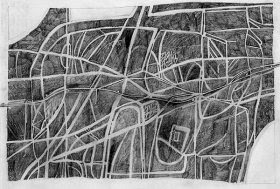 It is the mapping and change of this seascape that now appears as the big challenge – a future and appearing landscape undergoing a dramatic and complex process of change. This environmental mapping’s collision with the mapping of fossil resources can from hegemonic milieus be seen as a disturbing mapping. 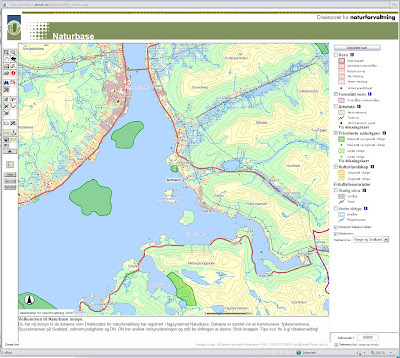 MAREANO maps depth and topography, sediment composition, biodiversity, habitats and biotopes as well as pollution in the seabed in Norwegian coastal and offshore regions.The MAREANO Programme aims to provide answers to questions such as: How is the seascape of the Norwegian continental shelf? What does the seabed consist of? How is the biodiversity distributed on the seabed? 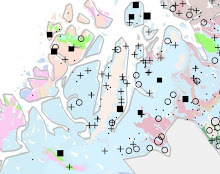 How are habitats and biotopes distributed on the seabed? What is the relationship between the physical environment, biodiversity and biological resources? How are contaminants stored in sediments? 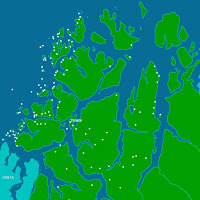 MAREANO is coordinated by the Institute of Marine Research, in collaboration with the Geological Survey of Norway and the Norwegian Hydrographic Service.The Programme is financed by the Ministry of Fisheries and Coastal Affairs, the Ministry of Environment and the Ministry of Trade and Industry via contributions from the National Budget. Lørdag hadde Nordlys en fire siders reportasje om funnene som havforskerne har gjort under kartleggingen av havbunnen utenfor Lofoten/ Vesterålen og Troms. Det er oppsiktsvekkende og ny kunnskap som her refereres. Og den vil gripe rett inn i den debatten om petroleumsaktivitet som kommer f or fullt når forvaltningsplanen skal revideres. Les videre i Oddvar Nygårds kommentar over! Bildet er tatt på et av Mareano prosjektets forskningstokt og viser et korallrev på 214m dyp på terskelen til Stjernsund ved Altafjorden. UNOSAT is a program of the United Nations Institute for Training and Research (UNITAR), providing satellite imagery & related geographic information, research and analysis to UN humanitarian & development agencies & their implementing partners. 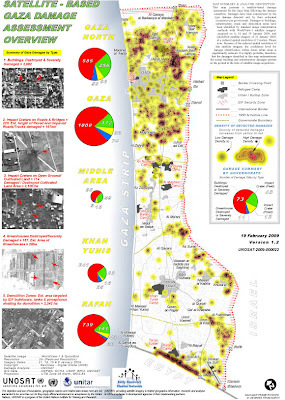 This map presents a satellite-based damage assessment for the Gaza Strip following the January ceasefires. Damages have been summarized by the type damage detected and by their estimated occurrence per governorate. Nordlys åpner i en periode fremover kronikksidene for tekster om forskning innen energi, marine ressurser, kultur, næring og utvikling i nordområdene. Peter Holm og Bjørn Eirik Olsen's kronikk om Marin sektor frem mot 2040, tirsdag 26.5 er den andre i denne serien. "The landscape is not focused until it becomes “necessary" to do so, and in this respect is not prepared for the future. The present map proposes to develop a new legend that seeks to enlighten the shadow. 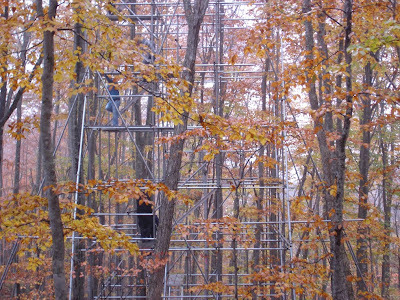 The landscape must be prepared for and resist the next leap by remaining the superior space in an unforeseeable future. This will force an aesthetics which will have to operate on a large scale, and which must deal with more temporal than the constructed world." Naturbase er et kartbasert innsyn som viser data om natur og friluftsliv som Direktoratet for naturforvaltning (DN) har registrert. Dataene er samlet inn av kommunene, fylkesmennene, Sysselmannen på Svalbard, sektormyndigheter, Norsk Polarinstitutt (NP) og DN. Du får opp et kart over Norge og Svalbard når du starter Naturbase. Her har jeg zoomet meg inn til Sortlandssundet og Sigerfjorden hvor skal feriere et par uker i sommer. Områder som er vernet, eller foreslått vernet, etter naturvernloven, Svalbardloven, Svalbardmiljøloven og viltloven // Naturtyper og arter som er viktige for å opprettholde mangfoldet i naturen. // Arter som har spesiell betydning for jakt og annen høsting. // Kulturlandskap med viktige biologiske og/eller kulturhistoriske verdier. // Friluftslivsområder som er sikret for allmenn bruk ved at staten har kjøpt dem eller skaffet seg spesielle rettigheter i dem. // Motorferdselsreguleringer, reinsjaktområder, ilandstigningsplasser m.m. på Svalbard. I Sverige finnes en naturkartbase organisert av lansstyrelsene, for Skåne heter den Naturguiden med viewer. Den tilsvarende naturkartbasen for Danmark er: Miljøportalen med arealinfo. På Bent Svinnung's interaktive kart som finner du lenker til noen av hans favorittplasser, fra Helgelandskysten til yttersia av Troms, samt en del informasjon om beliggenhet, tilgjengelighet, praktiske tips, historikk. 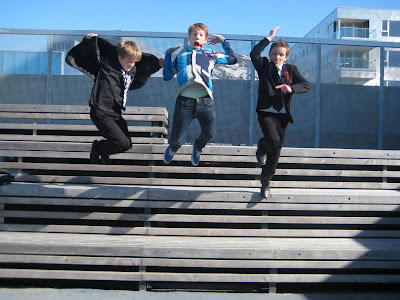 Jeg har stor glede av å klikke på de hvite punktene på dette kartet og studere turbeskrivelser og se fantastiske bilder. Yttersida av Troms er et eldorado for dem som bedriver turliv, uansett om framdriften skjer med åre, seil, motor eller beina. Masse rullesteinsfjærer, sandstrender, holmer og skjær, egger og vegger. Nok til å ta pusten fra de aller mest blaserte. "A walk through H: The Reincarnation of an Ornithologist " by Peter Greenaway is a 40-minute abstracted journey film, told almost entirely through the use of a series of 92 maps, - A friend of mine showed me this short film when I was studying architecture at BAS in early nineties and it is still one of my favourites. The film is "set" entirely in the world of "H," which is represented only by Tulse Luper's maps, sprinkled with occasionally intercuts with images of birds and sunsets. The panning along the paper surfaces of the imaginary maps is intriguingly fascinating and so is the narrator’s absurd dry voice describing how he came to possess each of these maps, and what his journey is like. At the official website, petergreenaway.org.uk you can read Greenaway’s own idea about A Walk through H: "I've always been fascinated by maps and cartography. A map tells you where you've been, where you are, and where you're going - in a sense it's three tenses in one. It's also an amazing ideogram of information that is very useful and, perhaps most pertinently, also not at all useful. My father had recently died, and the subtitle of the film was 'The Reincarnation of an Ornithologist' - my father was one. Through his life he had amassed an extraordinary amount of information about bird study, and I was very aware that with his death - as indeed with any death - a vast amount of very personalized information had gone missing, was totally irrecoverable. The film is on the journey a soul takes at the moment of death, to whatever other place it ends up - H being either Heaven or Hell. I devised 92 maps to help this particular character get there. The whole film was divided into five sections that represented movement from a very urban landscape to a wilderness landscape, and there were references and cross-references to all sorts of systems." A new global digital elevation model covers 99 percent of the Earth’s landmass to a resolution of 30 metres. The terrain map is based on imagery from the Japanese ASTER (Advanced Spaceborne Thermal Emission and Reflection Radiometer) instrument on NASA’s Terra satellite. From NASA’s press release: "This is the most complete, consistent global digital elevation data yet made available to the world," said Woody Turner, Aster program scientist at NASA Headquarters in Washington. 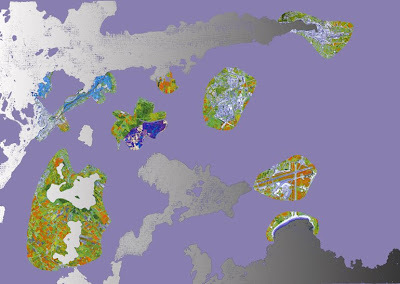 "This unique global set of data will serve users and researchers from a wide array of disciplines that need elevation and terrain information." According to Mike Abrams, Aster science team leader at NASA's Jet Propulsion Laboratory in Pasadena, Calif., the new topographic information will be of value throughout the Earth sciences and has many practical applications. "Aster's accurate topographic data will be used for engineering, energy exploration, conserving natural resources, environmental management, public works design, firefighting, recreation, geology and city planning, to name just a few areas," Abrams said. At the press release you'll also find links to visualizations of the new Aster topographic data, and you can download the Aster global digital elevation model at WIST and at ASTER GDEM . I found information about GDEM at The Map Room, Jonathan Crowe's intriguing and daily updated blog about maps. 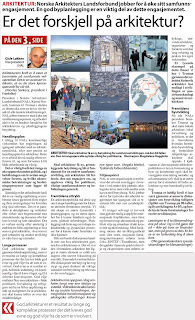 Kai Sibbern i Verdibørsen, P2s magasin for etikk og livssyn har lest Knut Eirik Dahls leder i tidsskriftet Marg om byen, med tittelen Byen under press, og har tent på denne. Idag intervjuet han Knut Eirik i 15-20 minutter som sendes i helgen. Marg er ute av trykkeriet i dag! Verdibørsen sendes i NRK P2, lørdag 23.5. kl. 8.05 og på samme kanal søndag 24.5. kl. 17.03. Etterpå ligger det ute på nettradioen og kan lastes ned som pod-cast. Verdibørsen er P2-programmet om verdispørsmål i vår tid: Såvel etiske, moralske som filosofiske og religiøse sider av livssyn og samfunnsliv presenteres og drøftes iløpet av de 55 minutter lange sendingene hver helg. Ved Kai Sibbern og Aase Cathrine Myrtveit. 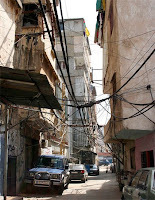 Bildet fra flyktningeleiren Bourj el-Barajneh i Beirut, Libanon, er hentet fra Lene E. Westerås' fortelling om SYNLIGE BYER som kan leses i Marg. "The urban ideals loom larger than the understanding of landscape, shining far more brightly as it were. The borders of urban space constitute an intellectual hinterland. The relation between what is built and the continued life of the landscape is destined to remain the major theme in the civic space of the future...."
In 1994 we participated in the international competition for the expansion of Copenhagen, called Ørestaden. The project received the second prize in the competition. 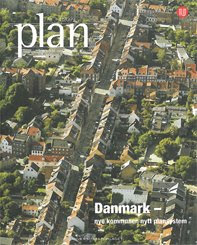 The idea universe of the project is duly published in the periodical "byplan" No. 5, 95. Through the presentation of the project's own text and a comprehensive critical review of the competition by Professor Jens Kvorning (jury member). The concept launched "The Game of Ørestaden" by setting up the structure plans as a set of playing pieces, in which different forces of change led to entirely different interpretations of this future urban landscape. The current development in Copenhagen, where other areas have come into the searchlight and are taking power from the "ideal" Ørestaden, confirms one of our statements in the competition - "The spirit of the place is bound to be found elsewhere". This week we will start a new series at the blog: D&U ONLINE PAPERS. Here we will make available a selection of texts, papers and lectures for download. Up to now 250 teams is competing in the three Norwegian cities Vardø, Trondheim and Oslo. This is a stunning amount of participants, and the number is growing. To meet this mass of ideas Europan is proudly presenting the jury for Europan 10, Norway. The international and interdisciplinary jury will begin its work after the competition deadline on June 29. 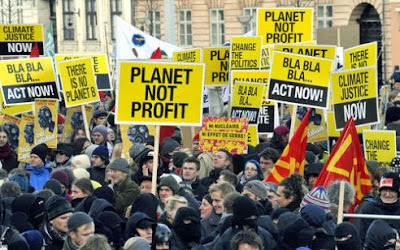 Change has become mantra: climate change, environmental, financial and political change. Change in nature and society has before resulted in change in the aesthetic language; as a sign of something upcoming or as a mirroring of something that has arrived. Is this the case in today’s urban space? Do we see and do we need new definition, new significance new use of the urban landscape and consequently a new aesthetic language in the urban space? Though the significance belongs to the large scale the signs often start in the small – in garden art and landscape architecture. The World in Denmark conference asks this question to landscape architects and their answers will take form as reflections and projects. 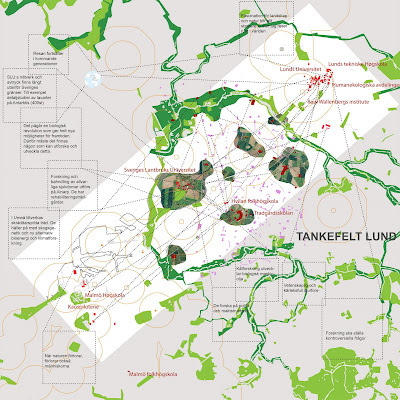 The conference is arranged by Danish Centre for Forest, Landscape and Planning, University of Copenhagen in co-operation with The Association of Danish Landscape Architects. Snart bor 80 % av jordas befolkning i byer, og dette får enorme konsekvenser for sosiale strukturer, arkitektur, landskap og mennesker. Byen blir satt under press. Med utgangspunkt i denne prosessuelle dynamikk, tar vi leserne med til byer som New York, Ramallah, Bologna, Tokyo, Beirut og Roma, til Nordområdenes mange merkelige byer og til Nederlands Randstaadt når Polarisen smelter. Her drøftes også byens toleransebegrep, demokrati og historiske utvikling. Og essensielt ; Hvem har retten til byen? og Hans Husum, Øystein Rø og Espen Røyseland, Tandi Dahl, Bjørn Vassnes, Ragnar Sandbæk, Olava Bidtnes, Erling Steenstrup, Abe Hayeem og Lene E. Westerås. Marg har for første gang invitert en gjesteredaktør. 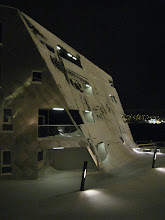 Det er arkitekt og professor ved Arkitekshøgskolen i Oslo, Knut Eirik Dahl: Hans leder er kalt. Street Corner Society har gjenoppstått over hele Europa etter røykelovens innføring. Legen Hans Husum, leder av Tromsø Mineskadesenter fortalte meg på et gatehjørne i Tromsø om Tony, den armenske bokhandleren i Beirut, som så det som sin ambisjon og oppgave i livet å holde sin bokhandel åpen gjennom alle krigssituasjoner. For Hans er denne bokhandelen et pustehull i hans arbeide blant krigsskadde, og han ga meg et løfte om å ta med en artikkel til Marg fra sin neste reise til Beirut. Denne teksten foreligger her og er én av tekstene som tegner tilstander som kun kan forståes som byer under kontinuerlig beleiring, under et konstant press, i desperate situasjoner. er påfallende melankolsk, og by og natur er på vei til å bli en foreteelse. En ny generasjon går nå positivt løs på denne nordlige tilstanden. Byene i nordområdene kan bare forståes gjennom å nytolke det territoriet de befinner seg i. Artikkelen ”Nordlige eksperimenter” utfordrer og undersøker denne sårbare tilstanden i stor geografisk skala. 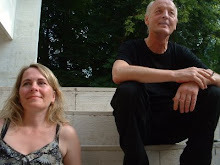 Knut Eirik and Kjerstin writes on Appearing and Disappearing landscapes in On Site. On June 6 the second edition of Landscape Architecture Europe On Site will be presented at the Architekturforum in Zurich. 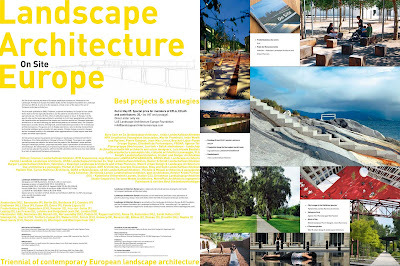 On Site is the triennial yearbook of European landscape architecture. Produced for the Landscape Architecture Europe Foundation (LAE) and the European Foundation for Landscape Architecture (EFLA), it aims to be the standard, critical review of the state of the art of European landscape architecture. The first book published in 2006, Fieldwork, explored the tendency in Europe for new urban forms built on former agricultural land to use the patterns and land forms of the former agricultural use. The title, On Site, refers to attitudes to place or locus. On site presents pioneering projects and strategies in landscape architecture from Berlin to Bordeaux, from Akkarvikoden in Norway to Evora in Portugal. 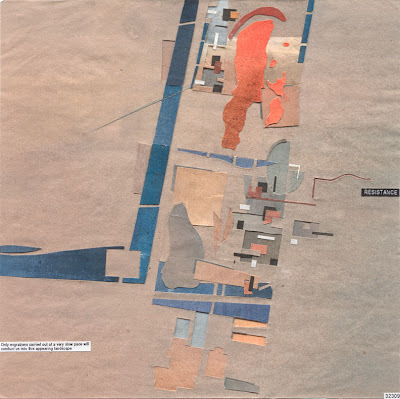 The projects are supplemented by essays on European cartography, the cultural landscape, the history of ideas in landscape architecture, the role of ideal landscapes, urban policies, and the pioneers from Portugal such as Francisco Caldeira Cabral and Gonçalo Ribeiro Telles.